Can tweets be used to detect real-time universal sentiment? In order to make this determination, we need to answer several questions. First, do tweets provide a dependable representation of sentiment? Second, can this sentiment be determined through an automated solution to determine if positive or negative sentiments were flowing through the stream of tweets. Finally, can this data be captured and analyzed in real-time to provide instant feedback? To answer these questions, we'll use the 2010 FIFA World Cup, starting with the 3rd Place Match on July 10, 2010. Capture and Analysis. We'll start with the last question. 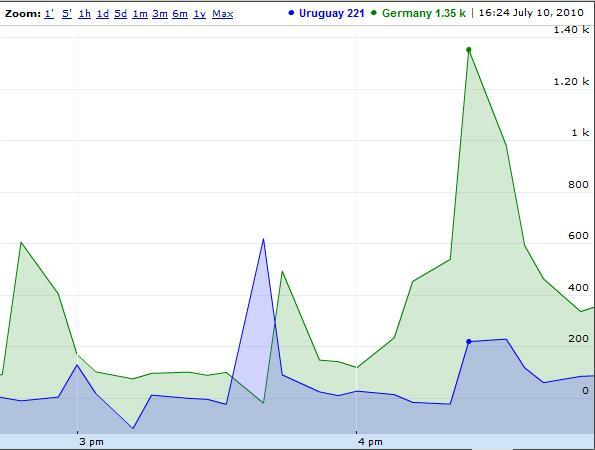 The OpinionEQ SMI Decision Platform can be connected to any real-time or stored data source, so in this case, we've connected to a stream of tweets relating to the FIFA World Cup 3rd Place Match on July 10, 2010. This process continuously captured thousands of tweets as they entered the Twitter stream and performed a real-time analysis of each and then plotted the results, in real-time, on the chart below. Do people express their true sentiments on-line? To decide whether people do, in fact, provide their actual sentiments on the Internet, the benefit of hindsight can be valuable. Looking at the above chart, could you determine which fans were more positive after the match between Germany (in green) and Uruguay (in blue)? A hint would be that the game ended just before 4:30. Over the course of two hours, tens of thousands of opinions were dispatched by soccer fans around the world. These opinions appear to represent a clear display of their emotions during the game. 18th minute (approx. 2:48): Germany scores first. Knowing this data from the results of the match, we would expect to see rises and falls in the sentiment for fans of both teams. The first goal is considered a very emotional one, and sets the team that scores it up as a strong leader in the game. The results above support this, giving Germany a stronger positive sentiment through most of the game. This is almost equalized by Uruguay just before 3:00 when they tie and surpassed only once when Uruguay goes ahead in the 51st minute. Very quickly, however, Germany ties again, and a strong positive sentiment is demonstrated for Germany, where it stays until the end of the game when Germany seals it with a last minute goal to win. Clearly, the automated analysis of the Twitter stream provides results identical to what an observer would expect over the course of the game. Can tweets, as well as other social media data, be used to accurately detect and report on sentiment and opinion? Based on the real-time results collected during the FIFA World Cup, the answer is a resounding "Yes", provided you have the right automated solution. The world expresses their opinions through real-time social media sources, such as Twitter, Facebook, and other popular outlets. The OpinionEQ SMI Decision Platform provides a means to capture and analyze this sentiment, providing accurate, real-time data to those who need it to make informed business decisions.